First-year student Athena Sardelis, a double major in English writing and psychology, balanced several water bottles in her arm as she rushed up the Market stairs to get to her Tower B dorm room. She was in search of water Tuesday night after Pittsburgh Water and Sewer Authority issued a “Precautionary Flush and Boil Water Advisory” after finding unsafe chlorine levels in one water treatment plant. An estimated 100,000 Pittsburgh residents throughout eastern sections of the city were left without safe tap water on Tuesday night. PWSA released a statement on their website saying recent tests of the water at the Highland Park water filtration plant revealed low levels of chlorine. Since chlorine is typically used to disinfect Pittsburgh water, PWSA instructed locals to take precautionary measures until further notice. PWSA also said the lack of chlorine could cause an increase in digestive upset, vomiting and headaches, as well as other ailments. The statement instructed residents within the affected area, including Oakland, not to use faucets or fountains for drinking water, making ice, brushing teeth, washing dishes or preparing food. PWSA told residents they should let water run for at least a minute, boil it for another minute and wait for it to cool before any form of consumption. Robert Weimar, interim director of engineering at PWSA, said they are “not sure what caused the [low chlorine] levels to occur” and that they want to exercise an “abundance of caution” by instructing customers not to drink the affected water. Weimar also said PWSA did not yet know when customers would be able to drink the water again. “Our goal is to restore the treatment center within the next few days,” Weimar said. The University of Pittsburgh notified all students — including those who live both on- and off-campus — around 7:30 p.m. on Tuesday to use bottled or boiled water. 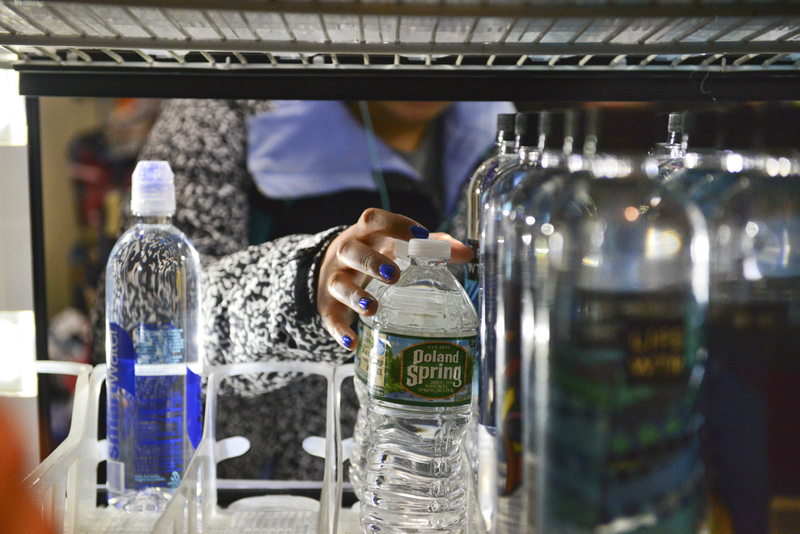 Panther Central sent out a separate email around 8:30 p.m., specifically to students who live on campus, saying they could obtain bottled water from the security desk at their residence hall. Pitt Environmental Health and Safety also sent out an email encouraging all Pitt student and faculty members to bring water with them to campus until the situation is resolved. Before these announcements, several students decided to make their way out of the dorms to find water on their own accord. Lines wound around the aisles and out the door at both 7-Eleven and Rite Aid on Forbes Avenue. Some students even decided to make a business of selling bottled water. Ama Edusei, 18, Britney Lewis, 19, and Asia Livingston, 18, all first-year students, were sitting in Towers Lobby Tuesday night selling water bottles for a dollar apiece. Shouting into the crowded lobby, they joked about what forms of payment their business accepted. “A dollar for water! We take Panther Funds and Venmo,” Livingston said. Edusei said they had luckily stocked up on a case of water just the day before. Around the same time Market To-Go ran out of water bottles, Market Central put up signs telling students not to drink water from dispensers. Instead, they started serving cups of bottled water at their Magellan’s station. This solution, however, didn’t solve all Towers residents’ problems. First-year student Claudia Salvato, met Sardelis in Towers lobby after taking a shower. Realizing she’d used tap water, she was surprised to learn she couldn’t even brush her teeth with water from the faucet.